Especially in the summer when feet sweat during hiking, biking or after a long day at work. Even if you wear breathable socks and shoes, your feet can sweat and cause smelly feet. Smelly Feet is caused by a mixture of sweat and bacteria. and over time small amounts of bacteria can build up. 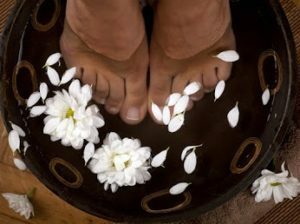 An all-purpose vinegar and water foot soak works for curing smelly feet and mild foot fungus. Vinegar has disinfecting properties that help to get rid of the bacteria. Of course, proper foot hygiene is important too. Wash your feet with warm soapy water first, and then soak. Take a closer look at that bottle of white vinegar lurking in the back of your kitchen cabinets before going out and spending your hard-earned money on foot products. 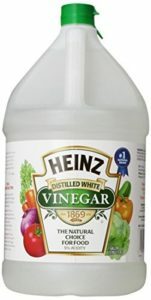 I think you’ll be pleasantly surprised at how vinegar can help your feet. Use a 50/50 mix of warm water and vinegar. Soak your feet for 30 minutes and dry thoroughly. Try doing this once a week. For daily use, a small spray bottle of vinegar and water can also do the trick. Spray the mixture on your feet and let dry. Once dry apply a paraben free Body Butter to your feet for a finishing touch. If you have cut or scratches on your feet do not use this mixture or the spray.